InkSlinger Printmaking and Showcase - A weekend of events held every Spring in Houston, TexXxas. Curated by Burning Bones Press. Burning Bones Press welcomes the public to enjoy hot dogs and Saint Arnold Brewing Co. refreshments, while viewing posters by artists from all over the country. The event is held Saturday night at Burning Bones Press, before It Came from the Bayou! All posters are hand printed, pertaining to the theme of It Came from the Bayou! 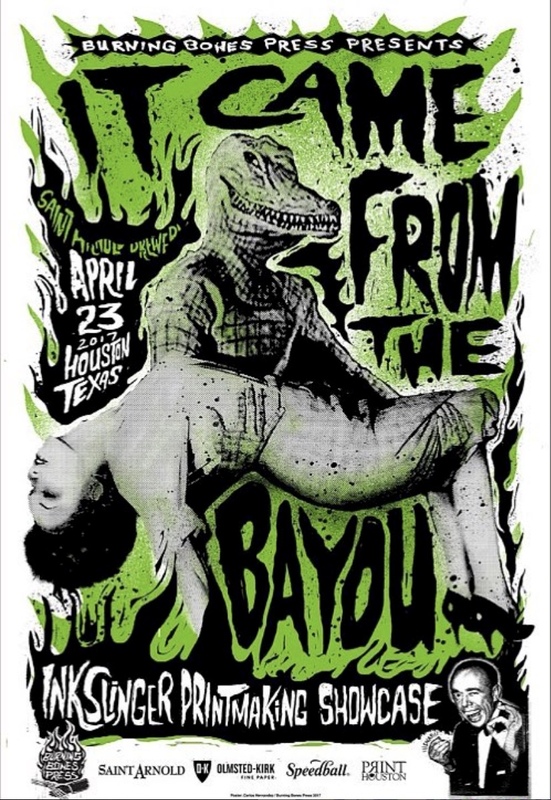 Printmakers from across the country descend upon Houston during Burning Bones Press’ Annual “It Came From The Bayou!,” printmaker print sale, every April at Saint Arnold Brewing Co. It Came From The Bayou! showcases work for sale by sought-after printmakers from across the U.S. This event is free and open to the public.